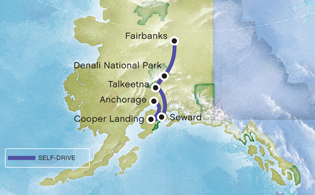 Explore Alaska from the comfort of your own rental car. This enticing 8-day Alaska tour is convenient and at your own leisure. With a number of included excursions, this tour package is perfect for the truly independent traveler! Pick up your rental car at the airport and then drive a short distance to your accommodations for the night. Spend the day exploring Alaska's second largest city at your leisure. Overnight Fairbanks hotel. Sleep in this morning or get up early to explore more of Denali National Park before you venture further south towards Talkeetna on Denali's south side. Take in the sights of the George Parks Highway or arrive early to your hotel nestled in the mountains of Denali State Park to take advantage of an optional excursion or simply to relax. Overnight Mt. McKinley Princess Wilderness Lodge. Drive south down the Parks highway towards Cooper Landing, located on Alaska's Kenai Peninsula. But first, stop for a glacier cruise aboard the mv Ptargmigan, where you'll cruise to the face of Portage glacier. Afterward, continue on the Turnagain Arm to your accommodations for the evening, located on the banks of the Kenai River. Overnight Kenai Princess Wilderness Lodge. Head back to Anchorage today taking in the sights of the Seward Highway as you go. Keep an eye out for beluga whales making their way towards the Cook Inlet or for Dall Sheep combing the mountainsides. Enjoy a leisurely evening upon arrival into Anchorage. Overnight Anchorage hotel. Drop your car off at the airport Avis office at the conclusion ofyour tour.